Welcome to the Dingo.org Website! Your current hosts are Blue Roo and Stormy. This site was last updated on February 28th 2007. 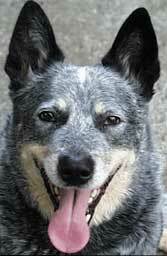 You just can't beat an Australian Cattle Dog for a great companion. They're brave, loyal, trustworthy, fun, and a dang sight smarter than a lot of people. Yeah, I know that might seem like a bit of a stretch, but if you doubt me, just check out this link and you will doubt no longer. I've had the pleasure of 3 Australian Cattle Dogs for company. Gizmo, a red, was with me for 11 years, and I lost him to cancer on 16 February 2001. ShadowDog, my blue, was with me for almost 14 years, losing a battle with congestive heart failure on 21 February 2005. I got them when they were each 8 weeks of age. 'Blue Roo' joined our family on 11 March 2001 at 8 years of age and is simply called 'Roo'. 'Stormy' joined our family on 09 January 2006 at just slightly less than 5 years of age. Welcome, Stormy! With these dogs, I have learned a tremendous amount about dogs and about myself. I've gained patience and an exceptional appreciation for an exceptional animal. I've learned to control my anger and to laugh at myself over the many things that I thought were so huge and found out were just not important at all. 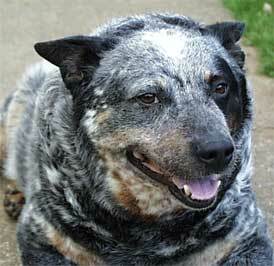 This site is dedicated to my Boys and to all of the other Australian Cattle Dogs out there wherever they might be. If you are lucky enough to be a parent to one of these beautiful and intelligent dogs, we welcome you to send us some of your pictures to add to our gallery. You can send them via e-mail, or drop us a line and we'll tell you where to send them via post. 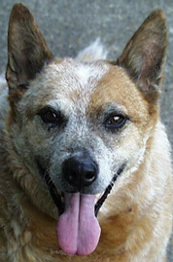 Please feel free to contact us about our web site, or just tell us how much you love your Australian Cattle Dog! You are visitor to our web site! If you believe you have received SPAM from the dingo.org domain, please click here.